For the first time ever we’re making our 25-minute documentary, Disaster at Nightingale, available for online viewing at no charge. Hurry…watch before World Penguin Day (April 25th) is over! Watch Now! But the fact that penguins are so iconic and so so beloved may have somehow misled us that penguins are happy and doing well. But the cruel fact is that over the last 50 years, a period during which we have seen unprecedented decline in our marine environment, so, too, have we seen such decline in many penguin populations. Penguins are, of course, marine creatures, as much a part of the ocean ecosystem as plankton, coral and whales. There are 17 species of penguins in the world. 15 of them are considered endangered. 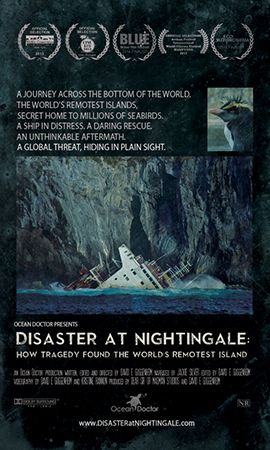 The focus of “Disaster at Nightingale” is the Northern Rockhopper penguin. Prior to the events of 2011 depicted in “Disaster at Nightingale,” its population had already declined by 90 percent over the past 50 years. 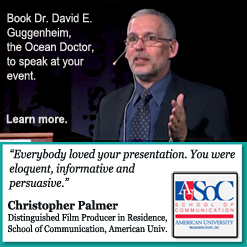 I am a marine scientist and have described myself as an accidental filmmaker. And tonight’s film, Disaster at Nightingale, is an example of an accidental film. I had no plans to make such a film. I didn’t have the right equipment nor any budget. In March 2011, I was a lecturer aboard an expedition ship sailing from the tip of South America to the tip of South Africa. Along the way, I found myself in the middle of the worst environmental disaster I have ever witnessed in my life and felt compelled to tell the story. This is a film about an ecological catastrophe that few know occurred, in a place that few know exists, resulting from a global threat that few are aware of yet hides in plain sight. My hope is that the story told by the 25 minutes of this film helps raise awareness about penguins and their threats, including the growing threats of global shipping. As a result of my accidental involvement in this disaster, Ocean Doctor has been working to support penguin conservation efforts in the South Atlantic to make sure a disaster like this can never happen again.